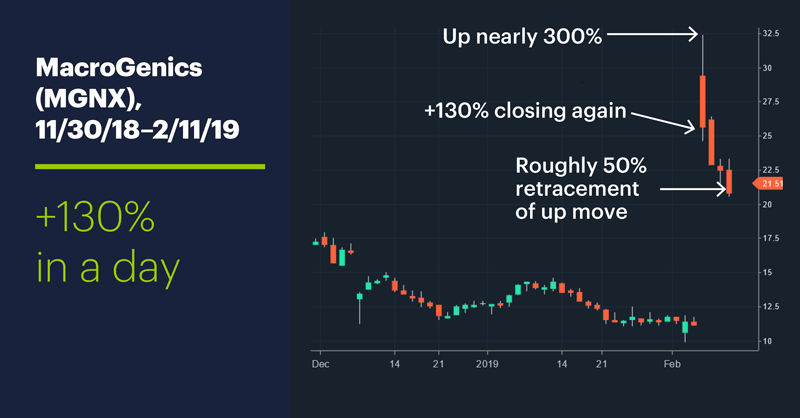 When a stock jumps 130% in a single day, as MacroGenics (MGNX) did last Wednesday, it’s natural to think the big story (and the trade opportunity) has come and gone. That’s potentially great news for cancer patients, as well as the company. As noted, it launched MGNX into orbit, pushing shares up nearly 300% intraday before the stock “settled” for that 130% closing gain (chart above). So, that would pretty much seem to be the end of the market story—especially for bulls, who may be understandably hesitant to pick up a stock that is more than twice as expensive as it was just a few days ago. First, as important as they are, successful clinical trials such as this aren’t the end of the story for a pharma company. They are the prelude to getting FDA approval for a drug (which MacroGenics hopes to get later this year), and then actually translating medical success into business success. In the long run, of course, hopefully it works out for everyone—patients, MGNX employees, and investors. In the short-term, however, there’s been plenty of action in the aftermath of last Wednesday’s surge. Power E*TRADE LiveAction scans showed MGNX options open interest yesterday was more than seven times its daily average (see above). 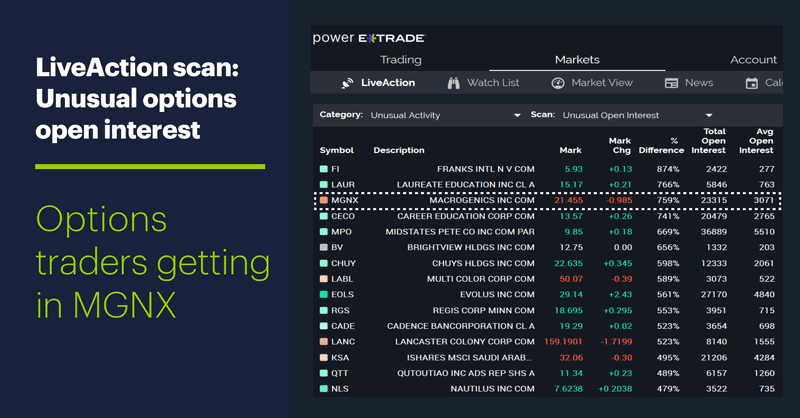 Open interest, which is the number of unclosed options positions, increases when traders are getting into a market more than they’re getting out of it. This could be a signal that traders still expect more action in the stock. So far, they’ve gotten it. In addition to pulling back around 21% on February 6 from their intraday high, MGNX shares sold off the next three days, including an 11% drop on February 7 and a 6%-plus decline yesterday. At this point, some stock traders have “decided”—by virtue of their actions—that MGNX’s February 6 rally was overdone. They, or other traders, may have a different outlook tomorrow. In other words, the stock has jumped to these levels before, and retreated. 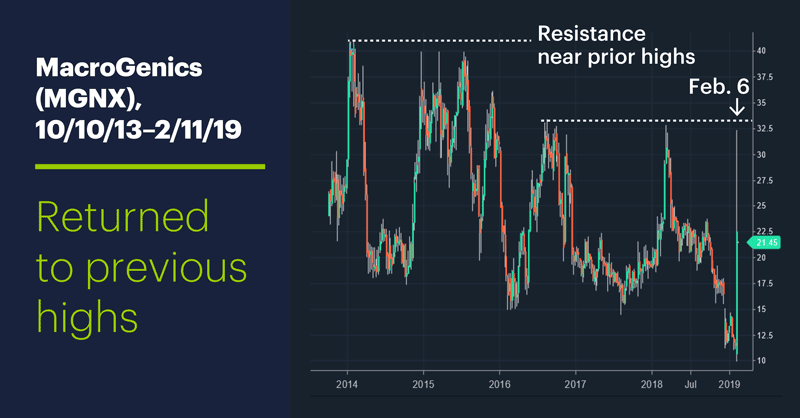 The 2014 highs around $40-$41 appeared to act as resistance for three rallies in 2015. Regardless of the stock’s longer-term prospects, traders appear to be actively engaged in a battle to decide whether giving back much more of the February 6 explosion is a good idea. And as unique as MGNX’s situation appears to be, these traders are unlikely to totally discount the influence of the broad market, as well as the sector and industry trends. Year-to-date, health care is the weakest S&P 500 (SPX) sector, and bio tech is one of that sector’s weakest industries. The clinical trial results may be in, but the stock’s story isn’t done. Market Mover Update: Oil started out the week on the downside, with April WTI crude oil futures (CLJ9) approaching support in the vicinity of the January lows (around $51–$51.60) before bouncing. Today’s numbers: NFIB Small Business Optimism Index (6 a.m.), JOLTS (10 a.m.). Today’s earnings include: Shopify (SHOP), Under Armour (UAA), US Foods (USFD), Activision Blizzard (ATVI), Akamai Tech (AKAM), Exelixis (EXEL), Fossil (FOSL), iQIYI (IQ), Occidental Petro (OXY), TripAdvisor (TRIP), Twilio (TWLO). 1 American City Business Journals. MacroGenics stock spikes from positive results of cancer drug trial. 2/4/19.